You would like to get all the press information about the Deutschland Tour? Just send us an email at presse@deutschland-tour.com. If you want to receive the press releases for not just the Deutschland Tour but also for other races of the A.S.O., like the Tour de France or Eschborn-Frankfurt, just tell us that in your email. After a splendid battle between the big guns of the Deutschland Tour all the way to the finish line of the fourth and final stage, Matej Mohoric managed to keep his overall leader’s red jersey and wins this 2018 edition of the race, ten years after its last appearance on the world cycling calendar. But The Slovenian had to give all he had to conquer the GC, threatened by all his rivals in the final loops around Stuttgart. The final day eventually saw Germany’s Nils Politt claim the stage win ahead of Mohoric and Caruso. At only 23 years of age, Mohoric conquers a second consecutive stage race after claiming the Binck Bank Tour just a week ago. Mohoric wins the event with a 6’’ lead over Politt and 12’’ over Schachmann. The beautiful Saarland area of Germany offered all the ingredients for an eventful battle between the big guns of the Deutschland Tour. Second yesterday behind Schachmann, Matej Mohotric enjoyed a sweet revenge claiming a fine victory. After the final hilly part of the day, the Slovenian proved to be the fastest of the reduced bunch, beating Nils Politt and Pieter Vanspeybrouck to the line. Junior World champion, U23 World champion and recently winner of the Binck Bank Tour, Mohoric conquers the overall lead and takes an option on final victory before the final day tomorrow in Stuttgart. Tour de France winner Geraint Thomas, runner up Tom Dumoulin and Romain Bardet are the big names of the Deutschland Tour set to serve as the platform for the new generation of German cycling. Local heroes of today (Marcel Kittel, André Greipel, Pascal Ackermann), tomorrow (Maximilian Schachmann, Nils Politt, Lennard Kämna) and after tomorrow (the young guns of the continental teams) are on their toes for the race due to take place from August 23 to 26. From Koblenz to Stuttgart, the whole German cycling community is involved in the event. Young German national champion Pascal Ackermann, 24, who already has six victories under his belt this year, will pin the bib number 1 on Thursday at the start in Koblenz the day after the team presentation in which the riders will travel by ski lift from the city’s castle to the Deutsches Eck at the confluence of the Rhein and Mosel rivers. The symbol of the German unity lays there. The sprinter of Bora-Hansgrohe – one of the two German WorldTour teams lining up, the other one being Team Sunweb – is also the symbol of the passing of the baton between two generations of fast men used to win a lot. When the Tour of Germany celebrates its comeback after a ten-year break on August 23, one rider will stand out among the 132 professionals. Geraint Thomas (Team Sky) will make his first official race appearance after winning the Tour de France at the Deutschland Tour. The 32-year-old Welshman has opted for the four-day race from Koblenz to Stuttgart to enter the second half of the season. The new Deutschland Tour is a “must” for many German pro cyclists. With 15 German WorldTour riders on the preliminary start list, it is clear that the majority of the German elite has decided to take on the four-day stage race, which runs August 23-26 from Koblenz to Stuttgart. The German contingent will be led by German national champion Pascal Ackermann, who has already ridden the entire course of the Deutschland Tour. Living up to the race’s motto of „Deutschland.Deine Tour.“ his Bora-hansgrohe team will ride their homeland race with five German riders. Team Sunweb is also coming with a strong line-up, and will look to sprinter Max Walscheid. Team Katusha-Alpecin, with top sprinter Marcel Kittel, plans a team for every race scenario. There is still a large question mark as to the participation of Tony Martin, due to the injury he suffered in the Tour de France. The 132 pro riders who will take part in the Deutschland Tour from August 23-26, will fight for four leader jerseys on their way from Koblenz to Stuttgart. In addition to the leader in the overall rankings, sprint and mountain rankings will be carried out on the four stages as well as the best young rider sought. The Amaury Sport Organization (A.S.O.) and Discovery Communications have entered into a long-term agreement for the international live broadcast of the Deutschland Tour on the Eurosport channels. The premiere of the new Deutschland Tour will take place from 23rd to 26th August and will cover four stages from Koblenz to Stuttgart. Eurosport will take over the complete two-hour live TV signal, produced by A.S.O. for each of the four stages of the Deutschland Tour using its television channels Eurosport 1 and Eurosport 2 as well as the Eurosport Player on mobile and web-based platforms. The live broadcast takes place in 60 countries of the pan-European and Asia-Pacific territory. Together with further TV-rights holders of the Deutschland Tour, the first edition of the race is already being distributed in 190 countries. The binding qualification criteria for the German Continental teams for the Deutschland Tour were announced at the start of the season. Now that the German championships have been held, the two best-placed German Continental teams in the BDR’s Rad-Bundesliga and the UCI Europe Tour have received invitations to the Deutschland Tour. The teams Lotto-Kern Haus, Dauner D&DQ Akkon, Heizomat Rad-Net.de and Sauerland NRW p/b SKS Germany have fulfilled these criteria and will take part in the Deutschland Tour. Germany’s only stage race for Elite Men takes place August 23-26 and runs over four stages from Koblenz to Stuttgart. In its very first year back, the Deutschland Tour can expect a highly rated peloton. Eleven teams from the highest category, the UCI WorldTour, have registered for the four-day stage race (August 23-26). 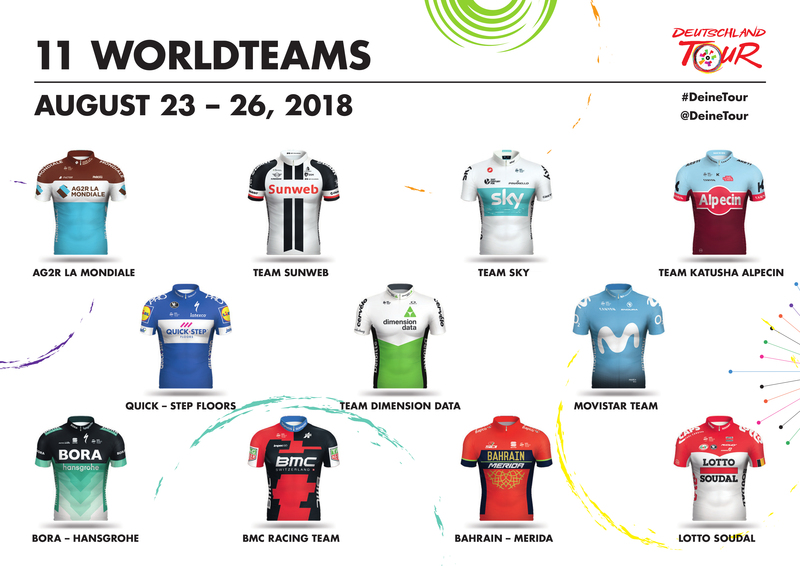 The list of UCI WorldTeams is led by the two German teams, Bora-hansgrohe and Team Sunweb, as well as Team Katusha Alpecin. Germany’s only stage race for Elite men is a special one in the racing calendar for these teams with a large contingent of German riders. The fans can also look forward to the top international teams with German riders: Quick-Step Floors, AG2R La Mondiale, Lotto Soudal, Movistar Team and Team Sky will take part in the Deutschland Tour. Teams Bahrain-Merida, BMC Racing Team and Team Dimension Data round out the start list of teams from the UCI WorldTour. The “kinder+Sport” exercise initiative from Ferrero is a partner of the Deutschland Tour and the cycling classic Eschborn-Frankfurt. In addition to the “kinder+Sport Basketball Academy” and their support for the SportabzeichenTour, “kinder+Sport” is expanding its engagement to include a further sporting activity with this partnership – cycling for kids. “kinder+Sport” wants kids and young people to be enthusiastic about cycling and to motivate them for more sport and exercise. The new edition of the Deutschland Tour will be broadcast live on German TV on all four days. From August 23 to 26, ARD, ZDF and Eurosport will report from each stage. The opening stage (August 23, Koblenz-Bonn) and the queen stage (August 24, Bonn-Trier) will be broadcast by ARD’s regional programs of those regions through which the Deutschland Tour passes. The pre-deciding stage on Saturday (August 25, Trier-Merzig) can be watched on the main ZDF program. The final stage, which runs from Lorsch to Stuttgart on August 26, will be broadcast by Das Erste (ARD). The Deutschland Tour runs through southwestern Germany from August 23-26 and visits five German states in its first new appearance. The terrain between the start in Koblenz and the finale in Stuttgart is very diverse and inspired the course designers to create a race which will leave the question of the final overall winner open until the final day. Sprinters and aggressive Classics riders will all have their chances on the four stages, which cover more than 740 kilometers. In its comeback, the Deutschland Tour is focusing especially on the fans. In addition to a extensive participatory program, downtown finishes in every stage will provide a great cycling experience to the fans. Bonn will be the fifth German city to host a stage of the new Deutschland Tour. In addition to the start in Koblenz and the finish in Stuttgart, as well as stage visits in Merzig and Trier, the race from August 23-26 will also visit Bonn. Bonn will be the only stage host in Nordrhein-Westfalen. The complete course will be announced on March 2, in the presence of German pro riders and representatives of the host cities and Bundesländer. The Jedermann Tour, the “every rider” race connected with the Deutschland Tour, will be held on August 26. 3500 hobby cyclists will make their way on the paths of the pro riders in and around Stuttgart on the final day of the four-day Deutschland Tour. Exactly six months before the start, registration opens on Monday at Deutschland-Tour.com/en/JedermannTour. Lorsch in southern Hessen will host the start of a stage in the new Deutschland Tour. With Rheinland-Pfalz (Koblenz, Trier), Baden-Württemberg (Stuttgart), the Saarland (Merzig) and Hessen (Lorsch), the Deutschland Tour from August 23-26 now runs through four German states. The complete course will be presented on March 2. The new Tour of Germany will be dressed by Santini Cycling Wear. The Italian manufacturer will design and produce the official leader jerseys for Germany’s only professional stage race (August 23-26). In addition to the pros’ equipment, 3,500 hobby athletes of the sportive event will receive free jerseys in the Deutschland Tour design. The sportive of the Tour of Germany, called Jedermann Tour, will take place on August 26th in Stuttgart and the Stuttgart region.